"Google Scholar provides a simple way to broadly search for scholarly literature. From one place, you can search across many disciplines and sources: articles, theses, books, abstracts and court opinions, from academic publishers, professional societies, online repositories, universities and other websites." from https://scholar.google.com/intl/en/scholar/about.html, About Google Scholar. 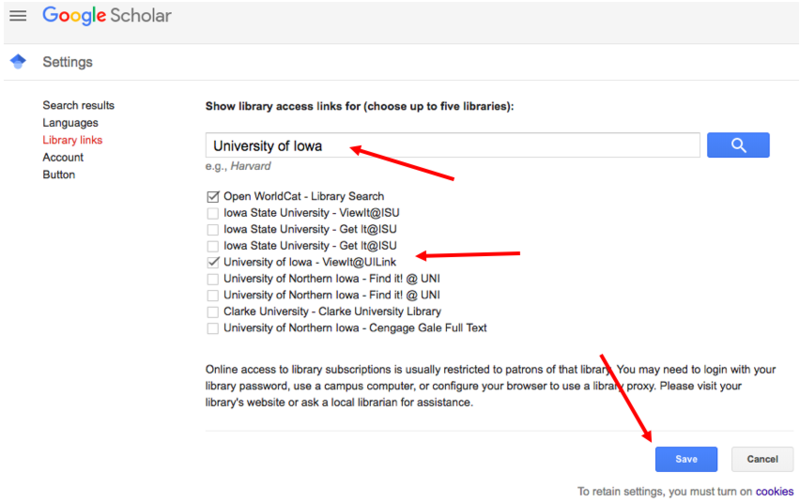 To be able to get to full-text articles from your Library's subscriptions when using Google Scholar, either go directly to http://scholar.google.com and follow the instructions below to get linked to our library, or use the Library's proxied link found in our list of databases, http://purl.lib.uiowa.edu/GoogleSch. 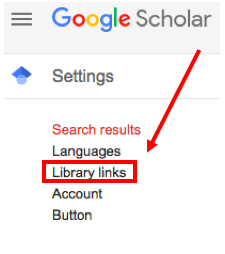 Use Google Scholar to get full-text articles with Library subscriptions - Link to the Library! Make sure The University of Iowa - ViewIt@UILink has a check mark next to it and SAVE that setting. If you are logged in to a Google Account, the setting should remain each time you login. large portion of the linked content is behind a paywall, so you will need to either be affiliated with an institution/university that has access to the content or use a local public library to make a request for the material. If you have the means, you may be able to purchase the information you seek article by article, but the cost will add up quickly.